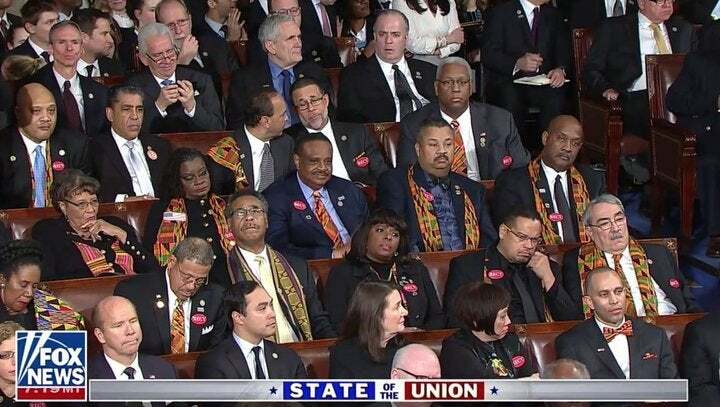 More and more the Democrats are being exposed as a Party of extremists, but last night during Trump's State of the Union Address, it was Full Frontal Exposure, and We The People must stop them. The Dem's were exposed as extremists last week when Donald Trump, not Barack Obama has put on the table a deal to give at least 1.8 million illegals a pathway to citizenship. Pelosi scoffed and called it making "America white again". It's not that they don't want the potential of another million or so votes (as they believe they will get the credit and the "Dreamer's" will vote Democrat much more than Republican), it's the WALL they don't want. They want OPEN BORDERS because that is the Elite, Globalist vision for the entire world. They hate America because we are a Free People. They hate America because we are an ally of Israel....who they hate even more. They hate America because this is the home of three more things they hate; the Constitution, Capitalism and Christianity. Liberalism at its core is about control. If you don't believe me, just take a look at what the Globalists at the U.N. are all about. There's is a supernatural hatred that defies logic or reason in my opinion. But last night, there was no hiding it. The nation saw it too. Yes, they hate Trump, but it's not just Trump, it is this nation they hate, and losing power to finish Obama's "fundamental transformation" that he promised that makes them completely lose it. Former Congressman Jason Chaffetz, who was in attendance for the State of the Union Address, said this morning on Fox News that what we heard and saw from the Democrats last night during Trump's speech on television was actually much worse in person. He said that Democrats were.....his word...."hissing". Hate, hate, hate. That is what we saw...and heard, last night. THE PRESIDENT: The state of our union is strong because our people are strong. Since the election, we have created 2.4 million new jobs, 200,000 new jobs in manufacturing, rising wages. Unemployment claims have hit a 45-year low. African-American unemployment stands at the lowest rate ever recorded. Hispanic-American unemployment has also reached the lowest levels in history. The stock market has smashed one record after another, gaining $8 trillion and more in value. 401(k), retirement pension and college savings accounts have gone through the roof. Millions of Americans will have more take-home pay. Three million workers have already gotten tax cut bonuses. Apple has just announced it plans to invest a total of $350 billion in America. ExxonMobil announced a $50 billion investment. Chrysler is moving a major plant from Mexico to Michigan. Toyota and Mazda are opening up a plant in Alabama. Last year the FDA approved more new and generic drugs and medical devices than ever before in our country’s history. We have sent thousands and thousands and thousands of MS-13 horrible people out of this country. The coalition to defeat ISIS has liberated very close to 100 percent of the territory just recently held by these killers. Freedom stands tall over one more monument: this one. This Capitol. This living monument. This is the monument to the American people. RUSH: Not one, not a single one of those statements was applauded by the Democrats. They all sat. How can anyone who calls himself or herself an American, not stand, or at the very least applaud these things? Hatred explains it. Extreme hatred. At another point in Rush's show today, he asked a question which I will paraphrase: "How can anyone negotiate with people like this? His point was that you can't. And I agree. You don't negotiate with your enemies. You defeat them. And sadly, the Democrats....who are not our father's Democratic party, but a party taken over by Socialists and Globalists and supported by the MSM and Hollywood Elites....are the enemy of our American heritage. Last night was all the proof I needed. They will be a party energized for the 2020 mid-terms. But they must not be allowed to win a majority in either the House or Senate. In fact another devastating defeat that ends up with the Republican's with majority's in BOTH HOUSES....might actually finish them for a decade of more. But they would come back eventually because freedom has an eternal, supernatural enemy, and that is who the Democrats really support.